Dr. Wang received his B.S. in Chemistry from Peking University in 1986 and his Ph.D. in Chemistry from Case Western Reserve University in 1992. Dr. Wang did his postdoctoral training in drug design at the National Cancer Institute, NIH between1992-1996. Dr. Wang was Assistant Professor at Georgetown University from 1996-2000 and Associate Professor from 2000-2001. 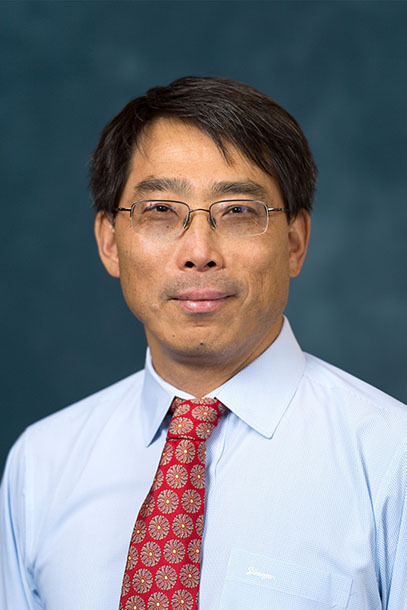 Dr. Wang joined the faculty at the University of Michigan Medical School as a tenured Associate Professor in 2001 and was promoted to Professor in 2006. Dr. Wang was named the Warner-Lambert/Parke-Davis Professor in Medicine in 2007. Dr. Wang serves as the Co-Director of the Molecular Therapeutics Program at the University of Michigan Comprehensive Cancer Center and is the Director of the Cancer Drug Discovery Program at the University of Michigan. Dr. Wang is the Editor-in-Chief for Journal of Medicinal Chemistry, a premier international journal in medicinal chemistry and drug discovery by the American Chemical Society and serves on the editorial board for several international journals. Dr. Wang has published more than 200 papers in peer-reviewed scientific journals and 100+ meeting abstracts, and is an inventor on more than 40 patents and patent applications. In addition to his academic role, Dr Wang is a co-founder of Ascenta Therapeutics and Ascentage Pharma, which were established to develop innovative anticancer medicines with technologies licensed mainly from the University of Michigan. Dr. Wang has been named National Academy of Inventors (NAI) fellow among 170 distinguished inventors announced in 2014. See the link at UoM and here. We have a computational laboratory, the Chemistry and Biology Laboratories located in the North Compus Reseach Center, Building 520 (Labs 1230, 1240, G401-G407). Our laboratories consist of faculty members, research specialists, postdoctoral fellows, research associates and graduate students, with expertise in computational drug design and informatics, synthetic and medicinal chemistry, biochemistry and protein chemistry, cell biology and in vivo tumor biology. We are also part of the Translational Oncology Program (TOP) in NCRC. In addition, we have extensive collaborations with structural biologists, cell biologists, pharmacologists and clinical investigators at the University of Michigan and in other institutions. The Wang lab has developed a number of computational methods and tools for drug design, which include the PDBbind database, X-Score and M-Score scoring methods, and the Comprehensive Herbal Medicine Information System for Cancer, among others. 1. A small-molecule inhibitor (AT-101) which targets Bcl-2/Bcl-xL/Mcl-1 - Phase II clinical trials for the treatment of solid and non-solid human cancer. 2. An orally active small-molecule IAP antagonist (AT-406/Debio1143) - Phase II clinical trials (NCT02022098) for the treatment of solid and non-solid human cancer. 3. An MDM2 inhibitor (AA-115/APG-115) - Phase II clinical trials (NCT02935907) for the treatment of advanced solid tumors of lymphoma. 4. A small-molecule inhibitor (BM-1252/APG-1252) which targets Bcl-2/Bcl-xL/Mcl-1 - Phase I clinical trials (NCT03080311) for the treatment of SCLC and other solid tumors. 5. A small-molecule IAP antagonist (SM-1287/APG-1387) - Phase I clinical trials in China for the treatment of human cancers. Professor of Medicine, Pharmacology and Medicinal Chemistry. Director, Cancer Drug Discovery Program. Co-Founder, Ascenta Therapeutics, Inc. San Diego, CA. Co-Founder, Ascentage Pharma Group, Hong Kong. Co-Founder, OncoFusion Therapeutics, Ann Arbor, MI. 1. Design, synthesis, characterization and development of molecularly targeted novel small molecule drugs for the treatment of human cancer with a focus on epigenetic regulated protein targets involved with protein-protein interactions (e.g. histone methyltransferases: EZH2, MLL1, DOT1L, MMSET/NSD2 and Bromodomain containing proteins) and immune checkpoint inhibitors (e.g. IDO1). 2. Design, synthesis, characterization and development of molecularly targeted novel small molecule drugs for the treatment of human cancer with a focus on compounds induce targeted proteins degradation. 3. Design, synthesis, characterization and development of molecularly targeted novel small molecule drugs for the treatment of human cancer with a focus on apoptosis pathway targets and protein-protein interactions (e.g. MDM2-p53, Bcl2-Bim, IAP proteins/caspases). 4. Design, synthesis and characterization and development of novel small-molecule ligands to target G-protein coupled receptors with a focus on the dopamine receptors. 5. Development and application of new computational and informatics methods and tools for drug design and discovery.